Ever since it’s creation almost 20 years ago, the Nike Mercurial has been at the heart of some of the biggest moments in football history. It was the Brazilian Ronaldo that first thrust this iconic silo so firmly under the spotlight, dazzling the opposition with his extravagant play and unbelievable ability to put the ball in the back of the net. Scoring the first ever Mercurial goal way back in 1998, Ronaldo paved the way for thousands of other players to follow suit and made the Mercurial one of the most popular boots on the planet. Since then, a new Ronaldo has become the face of the silo, never failing to wear his very own pair as he continues to break records and win trophies. The Nike Mercurial is made for the best players in the world, giving them the opportunity to steal the limelight they so desperately crave. Ronaldo certainly fits that mould. So, it’s fair to say that we were just a little giddy with excitement at the prospect of a brand-new release. Nike have been teasing us relentlessly for the past few days, showing little glimpses of what to expect and of the players set to wear the new designs. With social media in meltdown and an absolutely massive unveiling in London on Wednesday (7th Feb) evening, the hype train was unquestionably going full-steam ahead. And the new designs certainly don’t disappoint. With many fans left feeling a little underwhelmed by the rest of the ‘Fast AF’ boot pack, we could very well be looking at the biggest boot release of the year in the Nike Mercurial- and it’s still only February. Just like the rest of the ‘Fast AF’ pack, the new Mercurial has got unstoppable speed at the very heart of its design. Nike are recognising that players need speed all over the pitch, and their latest innovation looks set to be nothing short of a game-changer. Both the Mercurial Superfly and Vapor have been given brand-new releases here, with both boots looking very similar in their design and featuring the innovative 360 construction. This new Flyknit design means that players will be able to enjoy optimal fit and comfort, ensuring that your feet aren’t sliding around inside when flying down the wing or quickly changing direction. In short, the 360 upper will wrap around the wearer’s feet; fitting like a glove and ensuring that your pace isn’t being compromised by boots that don’t offer a perfect fit. For players such as Cristiano Ronaldo, Neymar and Kylian Mbappe, the new Mercurial serves up an opportunity for them to become even more dangerous. Gulp. The ‘Born’ Mercurial has been made for the most extravagant, flamboyant players on the planet, providing them with a platform to shock the world and create something out of nothing. Very few players have this ability, and even fewer can really pull off such a vibrant design. Nike have gone with a vibrant ‘Total Orange’ colourway, with the entire boot wrapped up in an explosion of colour that you just can’t take your eyes off. With black detailing and a soleplate sparkling with colour, these boots incorporate one of the boldest designs you’re likely to see this year. Speaking of the soleplate, it’s also worth mentioning that Nike have implemented strategically-placed studs, making sure that wearer can enjoy improved traction and (you guessed it) make the most of their explosive speed. These studs are place in the fore-foot and heel of the boot, with the former allowing aggressive acceleration and the latter to put the brakes on. 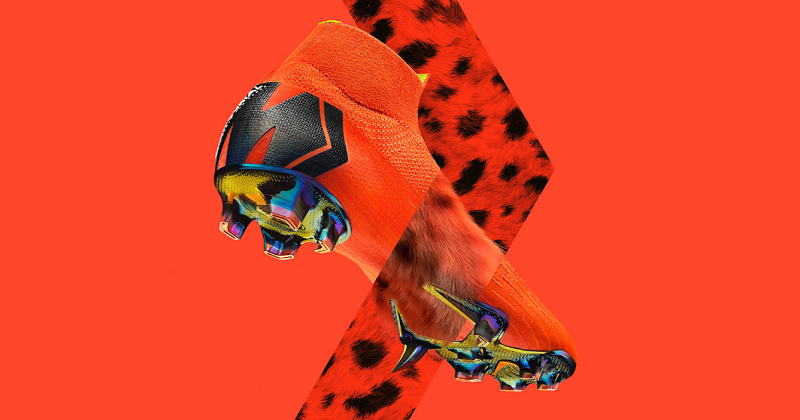 You don’t have to be a genius to see exactly why Nike ran with the cheetah theme throughout their promotional material. Bold. Innovative. Downright brilliant. We’re big, big fans of the new Mercurial here at FOOTY.COM, and we can’t wait to see them in action. Whether you’re playing in the Champions League Final or just having a quick five-a-side game with your mates, the Nike Mercurial Superfly and Vapor 360 could help you become the best player on the pitch. The new Mercurial football boots are due to be released next week, so make sure to compare prices with us and bag the best deal possible!